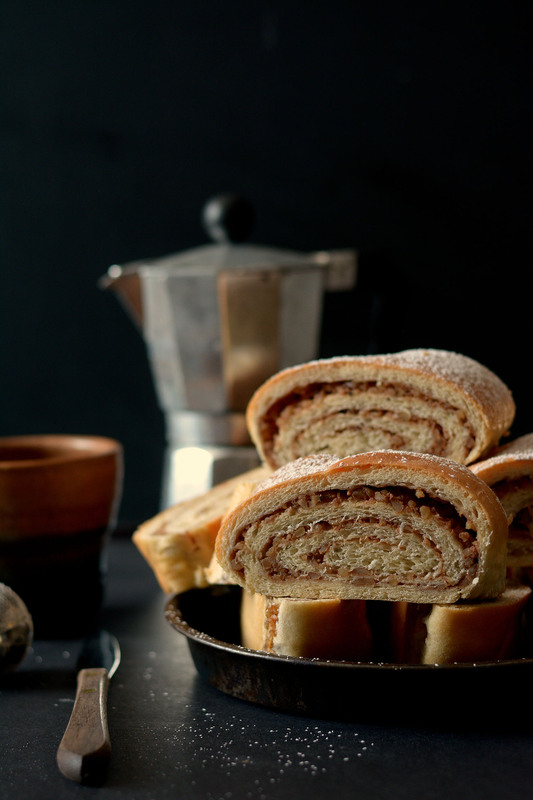 Favorite Eastern European rich walnut-swirled coffee bread. Traditionally served at Easter and Christmas, but is wonderful any time of the year. Combine yeast, 1½ cups flour, sugar and salt. Heat milk, sour cream and butter to 120-130°F. Add to flour mixture; blend on low speed. Add egg yolks and egg; beat 2 to 3 minutes on medium speed. By hand stir in enough remaining flour to make a soft dough. Knead on lightly floured surface 5 to 7 minutes or until smooth and elastic. Place dough in lightly oiled bowl; turn to grease top. Cover; let rise until dough tests ripe. Prepare Filling: In a medium-sized saucepan, combine slightly beaten egg, milk, walnuts, sugars and butter. Cook on medium heat until mixture resembles a paste, stirring constantly. Remove from heat; cool. Stir in vanilla. Turn dough onto lightly floured surface; punch down to remove air bubbles. Cover; let dough relax for 10 minutes. Divide dough into 2 parts. On lightly floured surface, roll each half to a 12x12-inch square. Spread half of cooled Filling to within 1 inch of edges. Roll up tightly. Pinch edges to seal; turn ends under. Place seam-side down on greased baking sheet. * Repeat with remaining dough. Prick top of roll every 3 inches with fork to eliminate air bubbles. Cover; let rise in warm place until indentation remains when lightly touched. Bake at 350°F for 25 to 30 minutes until browned. Cover lightly with foil to prevent over browning. Brush with melted butter to maintain a soft crust. Breads are very fragile when warm. Using two spatulas carefully lift Walnut Roll from baking sheet onto rack to cool. Sprinkle with powdered sugar when cool; slice to serve. *Using parchment paper to line baking sheet makes it easier to transfer rolls to cooling rack. Recipe featured at Bakeaholic Mama.